FROM THE BELTWAY TO DOWNTOWN: One of Baltimore's original expressways, the Jones Falls Expressway was conceived in 1943 as a collaboration between Baltimore city officials and Robert Moses, New York's master builder. The Jones Falls Expressway was to serve as the northern radial route connecting downtown - where the route was to connect to the never-built East-West Expressway - with the Baltimore (County) Beltway. Its location in the Jones Falls Valley was long a desirable one for travel: in 1804, a stone-and-gravel turnpike was built to connect downtown with Baltimore County. The Baltimore City Planning Commission unveiled more detailed preliminary plans for the expressway in 1951. The following year, voters approved a $10 million bond measure to pay for the city's share of the expressway. Under the original Federal-aid financing plan, the city and state together were to come up with 50 percent of the cost, with the Federal government picking up the other half of the cost. However, condemnation proceedings proved slow and arduous because of concerns about community disruption, especially in Mount Royal Terrace where residents feared the loss of trees. The City Council approved construction formally in 1955, at which time final design plans were accelerated. However, city and state officials decided to wait until the following year when the expressway was included in the Interstate highway system, which included the promise of 90 percent Federal financing. With this funding source guaranteed, work on the expressway - which received the I-83 designation soon thereafter - began promptly. On October 2, 1956, Mayor D'Alesandro broke ground on the expressway before a phalanx of engineers, city officials, and press members. DESIGN COMPROMISES: Despite the assurance of Interstate financing, Baltimore city officials had to compromise the design of the expressway in order to prevent a mass exodus of industry along the Jones Falls corridor. For this reason, the design speed of the six-lane expressway was kept at 50 MPH within Baltimore City (the speed was 60 MPH outside city limits) because of the limited sight distances, insufficient shoulders, and inadequate acceleration-deceleration lanes. We proposed to use the Jones Falls Expressway for that part of the Interstate system. We knew the design standards couldn't be met. But we had to weigh the costs of moving industry out of the valley against the costs of not designing to Interstate standards. Where we could widen out, we did. Whatever we could get without compromising industry, we did. Some of the curves aren't designed for 60 miles per hour. We needed more land, but we couldn't get the property. TOP: This 1962 photo shows the opening of a five-and-one-half mile-long segment of the Jones Falls Expressway (I-83), marking the single longest section of expressway to open. BOTTOM: This 1976 photo shows construction of the elevated extension of the expressway approaching downtown Baltimore. The original plans also called for turnoff lanes for buses to pick up and discharge passengers. This expressway bus service was to replace passenger rail service that had been in decline during the postwar years and was cancelled in 1954. However, this design provision never was implemented. Finally, plans were shelved to create a Jones Falls Valley Park - a "ribbon park" taking advantage of the river valley - along the expressway's right of way. The park was to have been designed by Baltimore architect George Konstritsky. Instead, water from the river was redirected along a series of 18-foot-diameter conduits. THE JFX OPENS, PIECE BY PIECE: The first section of the Jones Falls Expressway opened on December 16, 1961. Motorists were able to drive at 50 MPH along the three-mile-long section from Charles Street (at Oliver Street) north to Falls Road (near 36th Street). The following spring, the expressway was extended less than one-half mile south to Biddle Street. On November 2, 1962, an additional five-and-one-half miles of I-83 were opened to traffic, providing a direct link from downtown to the Baltimore Beltway (I-695). These three sections cost a total of $51 million to build. When the expressway opened, engineers made a wildly optimistic projection that it would be handle to handle 200,000 vehicles per day (AADT) without much difficulty, but later revised their projection downward to 120,000 vehicles per day based on 2,000 cars per lane, per hour. However, even at 55,000 vehicles per day by the end of the 1960's, the six-lane expressway was subject to chronic bottlenecks because of its design deficiencies. To cope with this congestion, state officials devised plans to expand the expressway to eight lanes in its entirety, as well as implement reversible flow lanes requiring the use of a flexible concrete barrier. These plans never were implemented because of their cost. WAITING FOR THE I-95 CONNECTION… For nearly two decades after the initial sections of the Jones Falls Expressway opened, the freeway's southern terminus was very much in doubt because the path of I-95 (then proposed as the "East-West Expressway") had not yet been determined. 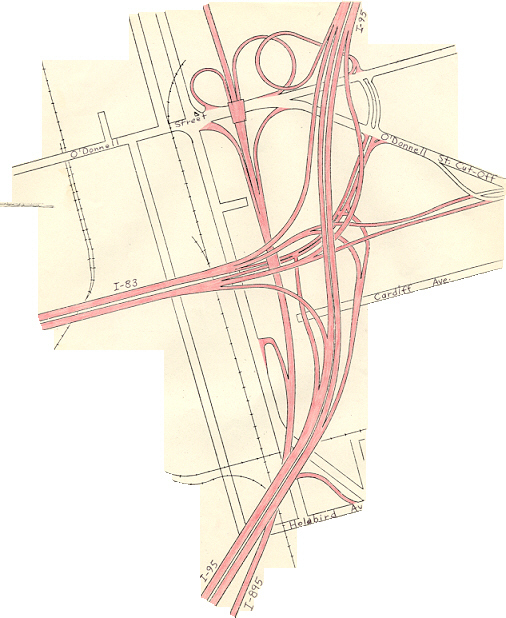 Under the proposed "Baltimore 10-D Expressway System" of 1962, a massive interchange was to have been built at the southern edge of downtown to accommodate I-83, I-95, and I-70. However, strident opposition over elevated freeways in the Inner Harbor and downtown areas shelved such plans. In response to community concerns, city and state officials developed the "Baltimore 3-A Expressway and Boulevard System" in 1969 that spared much of the Inner Harbor from elevated freeways. The new plan would have extended I-83 under Fells Point to connect with I-95 east of the harbor in the mostly industrial neighborhood of Canton. As plans for the I-83 terminus became closer to reality, the Maryland State Highway Administration (SHA) resumed construction of the expressway. A new section of I-83 connecting to Gay and Monument streets opened in 1977, and in 1983, another viaduct section opened south to Pleasant Street, with a dead-end highway stub reflecting the still-uncertain future of the I-83 extension through Fells Point. …BUT CONNECTING TO THE DOWNTOWN STREET GRID INSTEAD: Citing the potentially high costs for the I-83 extension - its cost was estimated at $609 million and expected to exceed $1 billion by the time it was scheduled for completion by 1987 - city and state officials removed the extension to I-95 in September 1982. To connect the dead-end stub of I-83 to the street grid, engineers designed a transition from viaduct to surface boulevard; south of the expressway's terminus at Fayette Street, they widened about three-quarters of a mile of President Street along the eastern edge of Inner Harbor. This final section of the expressway was completed in 1987. Known by locals as the "JFX," the Jones Falls Expressway carries approximately 110,000 vehicles per day. The expressway has a 55 MPH speed limit in Baltimore County outside city limits, a 50 MPH limit from the city line south to EXIT 4 (Biddle Street), and a 40 MPH limit from EXIT 4 to the southern terminus at EXIT 1 (Fayette Street). PLANS TO DISMANTLE PART OF THE VIADUCT DOWNTOWN: In 2005, prominent Baltimore planner Walter Sondheim developed plans to replace the existing I-83 viaduct from Fayette Street north to Eager Street; under such plans, the expressway would begin at Eager Street. Although the plan has the support of some city officials, any work likely would not take place until after 2020, when the next major rehabilitation of the viaduct is scheduled to take place. A CONNECTION TO I-95: In response to community concerns over the elevated freeways proposed for the Inner Harbor proposed in the "10-D" plan, the city and state revised its plans for I-83 under the "3-A" plan of 1969. Under this plan, the proposed eight-lane I-83 extension was to continue south through downtown along the Fellsway, then veer east through Little Italy and Fells Point before terminating east of downtown at I-95 near the current EXIT 57 (O'Donnell Street). By the mid-1970's, historic preservation had taken center stage, leading officials nationwide to dramatically alter or even cancel freeway plans. Even under Baltimore's "3-A" plan, community groups raised concerns over the design of the I-83 extension because it was designed almost in its entirety as a viaduct, which was opposed in the historic neighborhoods of Jonestown, Little Italy, Fells Point, and Canton. Between Fayette Street and Fells Point, the expressway, which was to be sunken 20 to 25 feet below the surface, was to have been be covered by a series of landscaped platforms. Entrance and exit ramps were to connect to President Street, which would have been rebuilt as a pair of one-way service roads straddling the depressed expressway. As the expressway was to swing to the east, a 1,700-foot-long tunnel was planned under the Inner Harbor at Fells Point. No toll was planned for the tunnel. As the tunnel was to emerge in Canton, Boston Street was to have been relocated along either side of the depressed expressway as a pair of one-way service roads. There was to have been a landscaped platform over the expressway connecting Canton with the shoreline. The $609 million extension had the support of Mayor William Schaefer (who later became governor). However, it would have displaced nearly 400 families and more than 80 businesses. In the end, it was the high cost of the extension that buried the project; the completion of I-95 under Baltimore Harbor was seen as a higher priority at the time. In place of the extension, the SHA built the surface connection from Gay Street south to Fayette Street. The state also diverted additional funds from the I-83 cancellation to the completion of I-97, I-195 (Metropolitan Boulevard), and I-370. AND A DIRECT LINK TO THE HARRISBURG EXPRESSWAY: State highway plans from the 1960's called for a northerly extension of the Jones Falls Expressway to connect to the existing I-83 (Baltimore-Harrisburg Expressway) north of Baltimore Beltway. The proposal was an attempt to relieve congestion on I-695 between the Jones Falls and Baltimore-Harrisburg expressways (known locally as the "section between the two 83's"). The JFX-to-Harrisburg Expressway extension was shelved in the early 1970's, but if it had been built, the bypassed section of the Baltimore-Harrisburg Expressway south of the Jones Falls extension may have received the I-483 designation (though this never was made official). SOURCES: "Mayor Breaks Expressway Ground," The Baltimore Sun (10/02/1956); "Beltway: East Side, West Side, All Around Town" by R. P. Harriss, The Baltimore News-American (5/04/1958); "Baltimore's Expressway Pattern and Progress," AAA Mid-Atlantic (January 1960); "Jones Falls Route Opened," The Baltimore Sun (12/17/1961); "Ways Across Baltimore" by Edgar L. Jones, The Baltimore Sun (8/26/1962);"The Jones Falls Expressway: New Link With Downtown," The Baltimore Sun (11/03/1962); "That Un-lonesome Road: Obsolete Expressway Ensures Motorists Plenty of Company" by James D. Dilts, The Baltimore Sun (5/20/1968); "20-Year Highway Needs Study," Maryland State Roads Commission (1968); "Schaefer Confirms Plan To Proceed With 3-A Roads" by G. Jefferson Price 3rd, The Baltimore Sun (3/26/1972); "State Primary Highway System," Maryland Department of Transportation (1972); "3-A Cost Estimate Rises by $100 Million in Year" by James D. Dilts, The Baltimore Sun (3/29/1974); "Jones Falls Link Cost: $600 Million" by Jeff Valentine and Michael Wentzel, The Baltimore Sun (11/14/1979); "Eastside I-83 Plan Nears Approval" by Robert Douglas and Edward Gunts, The Baltimore News-American (11/20/1979); Scott Kozel; Mike Pruett; C.C. Slater; Alexander Svirsky. I-83 shield by Scott Colbert.